Jaguar Land Rover has gone from strength to strength in recent years. The new Range Rover Sport has proved more popular than the last model. There is an eagerly-awaited new Discovery on the Horizon. The F-Type has put Jaguar back in the mass market for sports cars. But what about a rival for the BMW 3-Series and Audi A4? This is been a void in Jaguar’s model line up since the X-Type, until now. The new XE has arrived, with a range of new engines to boast power and efficiency. It all sounds rather good, so I just couldn’t wait to get behind the wheel. I’ve always had a soft spot for a Jag, so let’s see how I got on. I think the design team at Jaguar (and Land Rover for that matter) are making a rather good job of things at the moment. The F-Type is stunning, and the F-Pace is a beautiful design. The XE is a rather handsome beast as well, especially with the R-Sport touches added on. At the front, there are sleek, rounded grilles. Headlights are angular, with jagged LED daytime running lights to create a distinct presence in the rear-view mirrors of fellow motorists. 17-inch alloys come as standard, but my test car had optional 19-inch wheels. Window surrounds in gloss black give a sporty image. At the back there’s a twin exhaust and a smooth, rounded bumper design. The bootlid is lipped with a subtle spoiler, and the whole car looks very classy, with sporty touches. It looks like a Jaguar; standing proudly alongside other models. On the inside there’s nothing at all to grumble about either. On opening the door you are greeted by inviting, sumptuous seats. The leaping Jaguar logo sits proudly on the steering wheel. 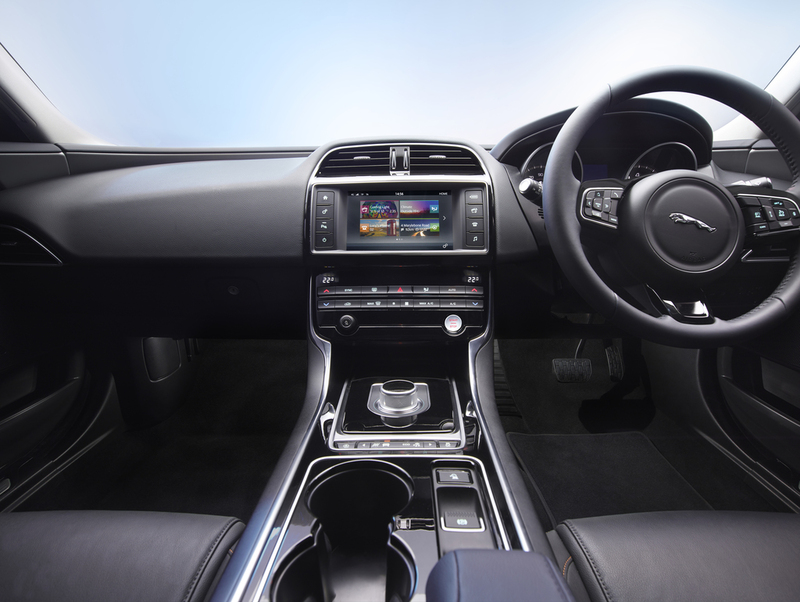 Crisp dials sit inside deep pods in front of the driver’s eyeline, whilst you can’t help but notice the sweeping curve running from the door handles right round beneath the windscreen, and brandishing the word Jaguar in the middle. Anyone who’s been in an XJ will recognise it, but it is a wonderful piece of design. The gear selector rises from the centre console, and there are some lovely angular features such as the air vents and door handles. The whole interior is sleek and stylish, which is exactly what you’d expect of a Jag. The plastics are of a high quality, and the finish is top notch. The new Ingenium engines are, to put it simply, breath-taking. Take the engine in my test car as a prime example. It’s a 2.0-litre, turbocharged diesel engine. There is a 163PS version, but my car had the more, producing 180PS and 430Nm of torque. Sent to the rear wheels via an excellent 8-speed automatic gearbox, it will dash from 0-62mph in 7.8 seconds and go on to a top speed of 140mph. No slouch then. The 6-speed manual, I am told, is very good. But for me it would have to be the auto. These ZF gearboxes have greatly improved in recent years, and when coupled to an engine as good as this makes for an excellent drive. Changes are smooth, and the engine’s torque is utilised to the fullest. Motorway cruising in 8th gear is effortless, and yet if you drop a few cogs the XE can get a bit of a sprint on when you need it to. The XE is also a brilliant car to drive. The chassis is balanced and agile. Steering is direct and weighty, giving a sharp turn-in and allowing you to point the front exactly where you want it. My car was the RWD version, and through corners the car will sit and squat, giving improved traction. The traction control system works well, allowing the back end a little bit of movement, but stepping in before you get yourself in too much trouble. The paddles behind the steering wheel work well on a B-road, allowing you to keep your hands on the wheel whilst being able to change up or down in an instant. It’s actually rather engaging, and makes you feel more ‘at one’ with the car. Suspension on the R-Sport is good; comfortable on the motorway and composed on a B-road. As well as being good in the performance category, the Ingenium units are even better here. The 180PS auto RWD of my test car emits 111g/km on the optional 19-inch wheels. That’s a mere £30 road tax, and free in the first year. The intelligent start/stop technology works well with the automatic gearbox; something that’s easy to take for granted. But it’s not just emissions where the XE shines. The average fuel consumption is a very respectable 67.4mpg, which will please anyone who chooses to buy one. The Ingenium engine range is a testament to how for engine technology has come, and has completely reshaped the Jaguar Land Rover brand image when it comes to economy. The XE has all the features you would expect of a saloon car. The boot is large, albeit with a somewhat limited opening. The cabin is spacious; adults will be comfortable in both front and rear seats. The R-Sport has a host of standard equipment to make it a great car to live with, including cruise control with speed limiter, Bluetooth hands-free, iPod connectivity, auto-dimming rear-view mirror, dual-zone climate control, rear parking assist, hill start assist and traffic sign recognition. Various options are also available to suit personal requirements and make life even easier. The Highway Technology Pack (£2,665) which adds adaptive cruise control with queue assist, blind spot monitoring, infrared reflective windscreen and a heads-up display. Power Convenience Pack (£920) adds keyless entry and a power tailgate. Auto-dimming, power-fold heated door mirrors with approach lights are just £285. There is just something about Jaguar. It has an air of British-ness about it, and in doing so brings with it a great sense of pride. From the moment you lay eyes on it, it will win you over. You may be forgiven for thinking that the economy of the Ingenium engines would be to the detriment of performance. That is until you head down a decent B-road, where the XE comes to life. And when it comes to life, the XE will have you grinning from ear to ear. Make no mistake about it; this is a driver’s car. But it’s also a family car, and a rather good one at that. It’s a commuter car too; eating up the motorway miles. The infotainment system is brilliant and easy to use, making sure you have your favourite soundtrack for any type of journey. And that just about brings my week with the Jaguar XE to an end. It was a rather insightful week; I now know just how good it is. To me, this is the car of choice in the small executive saloon market. It looks great. The Ingenium engines are sublime. You can opt for an AWD version. It ticks all the boxes. Prices for the XE start at £26,990 with the R-Sport starting at £29,740 for the 2.0-litre petrol, 200PS version. Be careful with the option boxes though, because you can rather easily get to the wrong side of £40k; my test car came in at £45,862. But after all is said and done, you can’t help but like the XE. For more information head over to your local dealer, or visit the Jaguar website where you can configure your own. The Audi A4 and BMW 3-Series better watch out… Jaguar is back.